Speaking of herbs, for the Sunday Stew this week, I wrote about the herb Chamomile. A really wonderful herb in so many ways. To read the Stew just click on the Cauldron on the right side of the page here. As per usual, part of my post is there and the entire post is here. At the end of this post here, you’ll find a link to again print out the info, if you wish, for your BOS or herb book. I have hesitated a bit to write about Chamomile. I know several people who can’t drink the tea or even use external products with chamomile due to allergic reactions. So I’m going to start off by saying this: If you are allergic to ragweed, daisies, marigolds, or mums…you may not be able to ingest chamomile. You also may not be able to use it externally. So use great caution if you’ve never tried chamomile before ok? Allergic reactions can be a mild dermatitis or a full blown anaphylactic reaction. Now let me say this too, I have seasonal allergies due to ragweed and mold, but I have no trouble with chamomile. So again, be careful when and if you try it! Ok…warning done..so let me go on about all the wonderful things about chamomile for those of us who can enjoy this herb! There are two types of chamomile…Roman and German. The German is used most often in the USA but if you buy chamomile essential oil it will most likely be Roman. Both varieties have the same effects medicinally and magically of course. German Chamomile is an annual plant that will grow up to 2 1/2 feet high. The leaves are fern-like and the flowers look like small daisies..white flowers with yellow centers about an inch across. Roman Chamomile is a perennial plant that is wide spreading and only grows less than a foot tall. The leaves are slightly different and it has the same flowers. Roman Chamomile is often used as a ground cover. It can tolerate even being walked on! These plants belong to the sunflower family Asteraceae . The flower heads are the primary plant parts used in herbal medicine. Commonly found all over Europe and Asia. It was introduced to North America and Australia. You can find chamomile in the wild…. near road sides, around landfills and in cultivated areas as a weed. 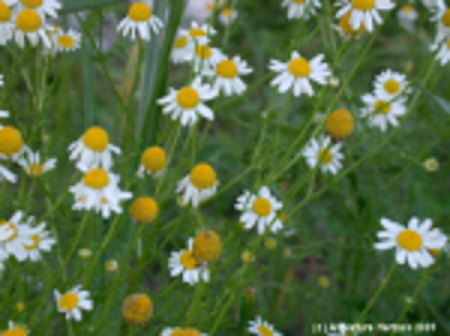 Chamomile requires Full Sun, and doesn’t tolerate really dry or HOT conditions. It can be planted from seed, cuttings and, of course, seedlings or small plants. Chamomile is self-seeding so even if you plant the annual version, it may come back. You can harvest the flower heads (the parts used for medicinal purposes) about 6-8 weeks after planting. 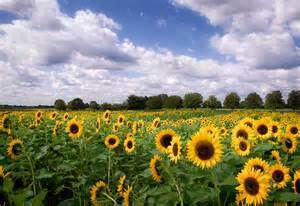 Harvest them in the morning and when the flowers look fresh and healthy. The flower heads can be used fresh or dried for teas and other herbal preparations. You can dry the flower heads in a basket or on a screen best. A cup of chamomile tea before bed is a must for many people I know..it just calms and comforts and helps you feel drowsy. But you can use it for so many things as you can see above. Put a cup of brewed tea in your bath to calm and soothe your skin and to let the scent calm your anxiety or stress. A bath in it will also help with hemorrhoids. Make a hair rinse using flowers brewed in water or apple cider vinegar. Make a poultice for cuts, rashes or sunburned skin. Make a cool compress to ease eye puffiness. Make a good healing balm or oil for muscle aches, swollen joints or a burn. Rinse your mouth with warm chamomile water or tea for sore gums. You can apply a drop of chamomile oil straight on an abscess in your mouth. A cup of chamomile tea with ginger added will aid nausea too. Just some of the ways you can use it! Children can use chamomile too in small amounts as a tea. You can also buy chewable chamomile tabs to help them to fall asleep or ease teething and sore mouth. Works to soothe a child who is anxious or stressed as well. My grandkids have used it with success. Chamomile essential oil blends well with cedarwood, clary sage, frankincense, geranium, lavender, rose, marjoram, neroli, orange, rosewood and ylang ylang essential oils. It works wonderfully in a simmering potpourri and in bath salts. If you are sensitive to chamomile..you may still be able to use the essential oil if it’s diluted well with a base oil etc. But again, try it on a small area before bathing in it or slathering it on your skin. – Sprinkle the dried flowers around your property to protect from spells or curses. I’m sure that you can come up with many ways to use chamomile in your daily Craft. Also, though I say that this is some of the magical uses for Chamomile….and for that matter with any herb I’ve talked about. The herbs may mean something completely different to you. That’s fine….use it for that purpose!! Chamomile is a very important herb in any Witch’s arsenal of supplies. Put it on your list of must have or at least must try! Greetings my friends! I’m hoping this writing finds you all doing well. How is your weather? Are you experiencing cooler weather? Here in Ohio as I’ve said before, we are having an extremely nice Summer. 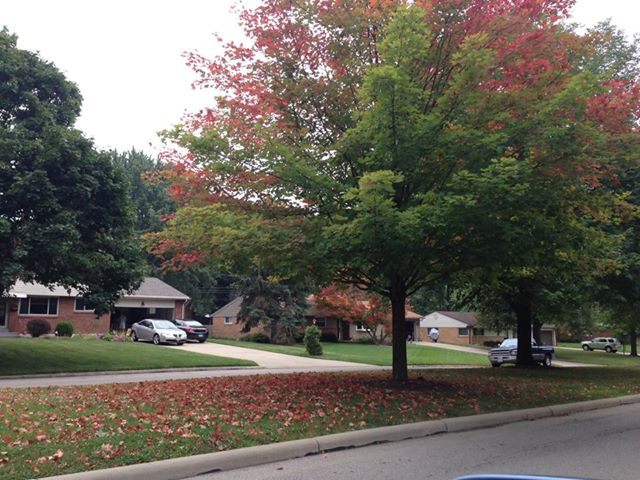 Hot days have been rare, and we’ve had many days that were Fall-like in temps and feel. This last week has been wonderful with 70’s during the day and as low as 50’s as night. This has brought on many changes already. Along with the shorter days/longer nights we have leaves already changing on the trees and bushes, some trees like dogwood and crabapple have their berries, the birds, squirrels and chipmunks are preparing for cold weather already, the gardens have lost some of their flowering beauty and my husband is mowing a bit less now. The Sun casts longer shadows in the morning, A/C is turned off and there seems to be a constant soft breeze. We could use more rain here but had some yesterday so that was great! Part of being a Witch, is feeling the changes in the Seasons. Feeling the Wheel turning. Many of us I know, have felt the change happening since before Lughnasadh, and no wonder! as it seems to be coming so much faster this year! I’ve been really busy with writing for both The Sunday Stew and Samhain’s Sirens. I’m studying a book with a book club, working on my herbalist certification when I have time, keeping up with my herbal shoppe and of course all the things you all do too. Family, friends, house, grocery, cooking, my Circle gatherings, reading, etc etc. A busy Witch am I! I have to admit that I’m feeling about done with working in my gardens etc. I’m ready to just enjoy the coming Autumn season. I’ve been burning my favorite scents of apple, pumpkin, cinnamon and such already! 🙂 I’ve also been in the mood to bake and cook! How about you? There is just something about this time of year I want hot comfort foods, sweet baked goods, homemade breads and good things from the last harvests of the gardens. Last week I made my amazing Red Hot Chex Mix and can’t remember if I posted the recipe here…so I’m going to share it with you now! Quick and easy, hot and spicy…you’ll love it!! It gets inhaled around here! This is NOT the one on the back of the chex cereal boxes! *This is one of those recipes that I honestly have no measurements. But it’s easy to make so I’m passing it on! In a large roasting pan (I buy one of those aluminum throw away ones..so easy and no clean up!) place a stick of butter or margarine and put it in the oven to melt while the oven’s heating up. When butter is melted, add to pan any of the following to fill the pan full…not so full you can’t stir it up but full! *Now…this is up to each of you to do as you please. You can do different cereals (not sweet ones) like Cheerios or any other corn, wheat or rice cereal. 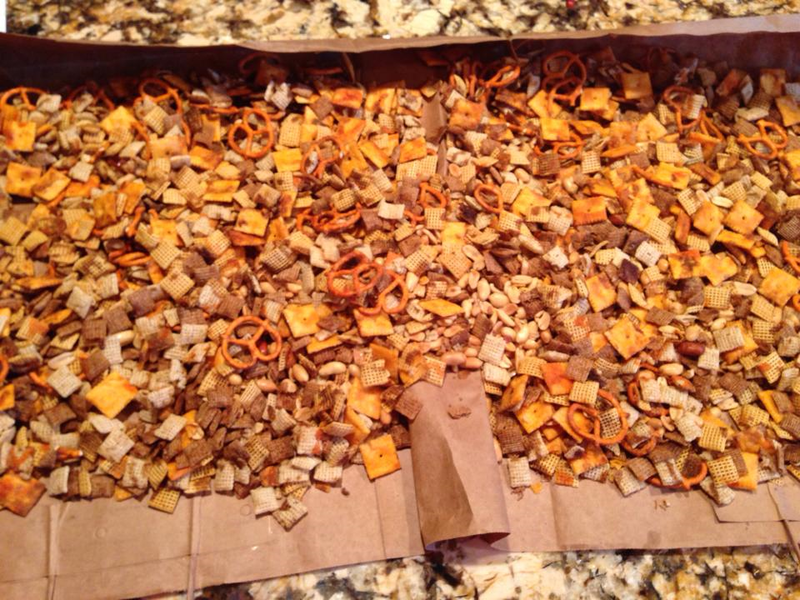 You can use other things besides the crackers or other kinds of cheese crackers like goldfish, or you can use bugles, pretzels, corn chips, sun chips, sesame sticks, melba rounds etc etc….it’s endless. I use cocktail peanuts or dry roasted peanuts…you can again use as you want. But fill up the pan!! Now give it all a good mix to coat with the butter. Now add these seasonings…heavy handed!! You can’t really do too much of this LOL. The more the better! Now don’t stir it….pop it in the oven for 20 mins. Remove from oven, give it a stir, add seasonings again…yep…again….and put back in oven. Do this 4 times! The last time I may or may not add anymore of any of the seasonings. If it’s looking well coated it’s done except for oven time. If it still looks like it could use more..go for it! After 4 x 20 mins of baking…dump the pan out onto a brown paper bag to cool. This will make 2 gallon sized bags full!! There is enough to share with someone or a couple someones so DO! I’ll be back soon with info about another herb and soon….Mabon! Hope you all are having a Magickal Sun day!